Mounted skeletons of Tyrannosaurus (left) and Apatosaurus (right) at the AMNH. 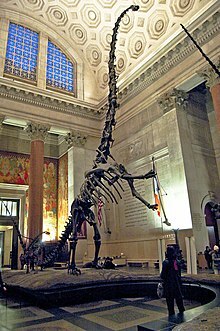 This list of dinosaurs is a comprehensive listing of all genera that have ever been included in the superorder Dinosauria, excluding class Aves (birds, both living and those known only from fossils) and purely vernacular terms. The list includes all commonly accepted genera, but also genera that are now considered invalid, doubtful (nomen dubium), or were not formally published (nomen nudum), as well as junior synonyms of more established names, and genera that are no longer considered dinosaurs. Many listed names have been reclassified as everything from birds to crocodilians to petrified wood. The list contains 1444 names, of which approximately 1060 are considered either valid dinosaur genera or nomina dubia. There is no official, canonical list of dinosaur genera. The closest is the Dinosaur Genera List, compiled by biological nomenclature expert George Olshevsky, which was first published online in 1995 and is regularly updated. The most authoritative general source in the field is the second (2004) edition of The Dinosauria. 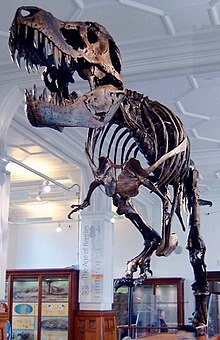 The vast majority of citations are based on Olshevsky's list, and all subjective determinations (such as junior synonymy or non-dinosaurian status) are based on The Dinosauria, except where they conflict with primary literature. These exceptions are noted. Junior synonym: A name which describes the same taxon as a previously published name. If two or more genera are formally designated and the type specimens are later assigned to the same genus, the first to be published (in chronological order) is the senior synonym, and all other instances are junior synonyms. Senior synonyms are generally used, except by special decision of the ICZN (see Tyrannosaurus), but junior synonyms cannot be used again, even if deprecated. Junior synonymy is often subjective, unless the genera described were both based on the same type specimen. Preoccupied name: A name that is formally published, but which has already been used for another taxon. This second use is invalid (as are all subsequent uses) and the name must be replaced. Preoccupied names are not valid generic names. Nomen dubium (Latin for "dubious name"): A name describing a fossil with no unique diagnostic features. As this can be an extremely subjective and controversial designation (see Hadrosaurus), this term is not used on this list. Replica of an Allosaurus skeleton. 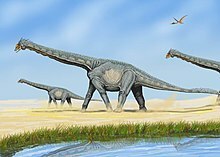 "Arkanosaurus" – variant spelling of "Arkansaurus"
Artist's restoration of a trio of Aucasaurus. A view from below of the rearing Barosaurus mounted in the American Museum of Natural History in New York City. "Carnosaurus" – nomen nudum, probably a typographical error for "carnosaur"
"Changtusaurus" – variant spelling of "Changdusaurus"
"Coelosaurus" – preoccupied name, now known as Ornithomimus and Archaeornithomimus. "Coelurosaurus" – nomen nudum, probably a typographical error for "coelurosaur"
"Dachungosaurus" – variant spelling of "Dachongosaurus"
The painting Laelaps by Charles Knight, depicting two Dryptosaurus fighting. Early, inaccurate sketch of two Iguanodon. 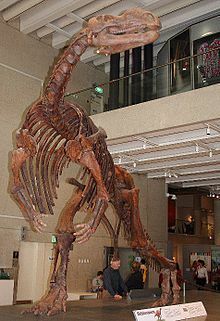 "Khateranisaurus" – misspelling of "Khetranisaurus"
"Koreasaurus" – nomen nudum; probably an alternate spelling of "Koreanosaurus"
"Lancangjiangosaurus" – variant spelling of "Lancanjiangosaurus"
"Lancangosaurus" – variant spelling of "Lancanjiangosaurus"
Sketch of the sauropod Mamenchisaurus. Cast of a Muttaburrasaurus skeleton. Artist's restoration of a pair of Nanshiungosaurus. "Proyandusaurus" – nomen nudum; Hexinlusaurus. Profile sketch of the head of Rinchenia. Shenzhouraptor – actually a bird; likely junior synonym of Jeholornis. Artist's restoration of the giant theropod Spinosaurus. Early sketch of a Struthiomimus. "Sulaimansaurus" – misspelling of "Sulaimanisaurus"
"Tyreophorus" – nomen nudum, probably a typographical error for "thyreophoran"
Illustration of the skull of Udanoceratops. Uncited genera names can be attributed to Olshevsky's "Dinosaur Genera List". Dalianraptor is listed by Olshevsky, but omitted from this list, since it has not been described as a non-avian dinosaur in a published source. ↑ ୫.୦୦ ୫.୦୧ ୫.୦୨ ୫.୦୩ ୫.୦୪ ୫.୦୫ ୫.୦୬ ୫.୦୭ ୫.୦୮ ୫.୦୯ ୫.୧୦ ୫.୧୧ ୫.୧୨ Lambert, D. (1993). "A to Z of Dinosaurs" In: The Ultimate Dinosaur Book. Dorling Kindersley. ↑ Worth, G. (Ed.). N.d. Chondrosteus. In: The Dinosaur Encyclopedia. Retrieved December 7, 2012. Attributes misspelling to Huene, F. von. 1907–1908. Die Dinosaurier der europaischen Triasformation mit Beriicksichtigung der aussereuropaischen Vorkominnisse. Geol. Paleontol. Abhandl. Suppl. 1, pp. 1–419. ↑ ୭.୦ ୭.୧ ୭.୨ Gregory S. Paul (2012). "Notes on the rising diversity of iguanodont taxa, and iguanodonts named after Darwin, Huxley and evolutionary science". Actas de V Jornadas Internacionales sobre Paleontologia de Dinosaurios y su Entorno, Salas de los Infantes, Burgos. Colectivo de Arqueologico-Paleontologico de Salas de los Infantes (Burgos). pp. 121–131. ↑ ୧୦.୦ ୧୦.୧ ୧୦.୨ Rana, A.N. 2006. Country’s first dinosaur fossils. DAWN March 25, 2006. ↑ ୧୪.୦ ୧୪.୧ Andrew T. McDonald (2011). "The taxonomy of species assigned to Camptosaurus (Dinosauria: Ornithopoda)" (PDF). Zootaxa. 2783: 52–68. ↑ Paul M. Barrett and Xu Xing (2012). "The enigmatic reptile Pachysuchus imperfectus Young, 1951 from the Lower Lufeng Formation (Lower Jurassic) of Yunnan, China" (PDF). Vertebrata PalAsiatica. 50 (2): 151–159. ↑ Olshevsky, G. (February 9, 2001). Sauropodus. Dinosaur Mailing List. ↑ This is an invalid name applied to what would now be recognized as a theropod, perhaps Megalosaurus, and considered invalid by the ICZN. For additional information, please see George Olshevsky's Dinosaur Genera List, The Theropod Database, or Dinogenera (French). Halstead, L.B. ; Sarjeant, W.A.S. (1993). "Scrotum humanum Brookes - the earliest name for a dinosaur?". Modern Geology. 18: 221–224. ↑ Worth, G. (Ed.). N.d. Tenchisaurus. In: The Dinosaur Encyclopedia. Retrieved December 7, 2012. Attributes misspelling to a Japanese guide to a Chinese dinosaur exhibit, 1981. And also to Glut, 1982. ↑ "Japanese theropod nomen nudum extravaganza" Dinosaur Mailing List. ↑ You Hailu, Li Daqing and Liu Weichang (2011). "A New Hadrosauriform Dinosaur from the Early Cretaceous of Gansu Province, China". Acta Geologica Sinica. 85 (1): 51–57. doi:10.1111/j.1755-6724.2011.00377.x. Olshevsky, G. (1995 onwards). Dinosaur Genera List. Retrieved July 30, 2013. Tweet, J. (N.d.). Thescelosaurus!. Retrieved April 16, 2009. Weishampel, D.B., P. Dodson & H. Osmólska (eds.) (2004). The Dinosauria, Second Edition. University of California Press, 861 pp. ISBN 0-520-24209-2.